After breakfast, we decided to drive several roads within the park to search for fresh elephant signs. 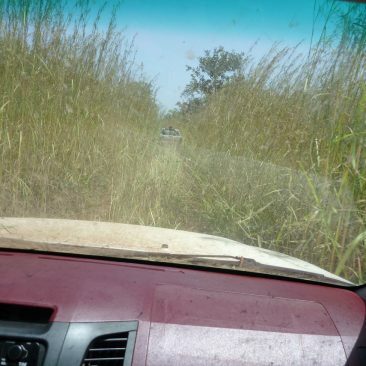 We drove south out of camp, reached a road that took us to the western boundary of the Reserve, then headed north and then east, and finally southeast back to camp. We drove for 10 hours without seeing any elephant signs—or any other wildlife for that matter. One of the problems is that the grass is between two and three feet high throughout much of the Reserve. 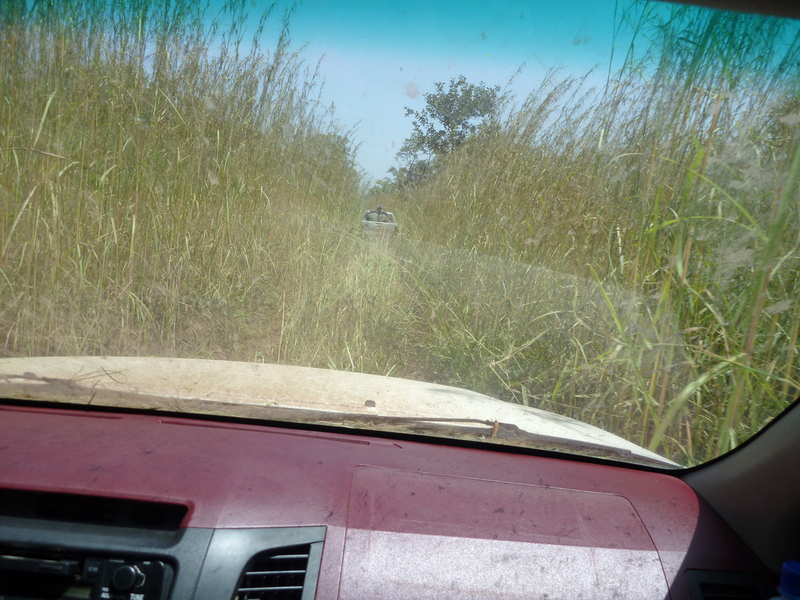 When we are driving through the grass, it is almost like driving through a tunnel. The advantage of the grass being so tall is that we would be able to easily identify any places where the elephants crossed the roads. There were no crossings evident, however. The rangers had divided into two teams, one searching the northeast and the other searching the northwest. Neither team found fresh elephant signs. Andrew and Gilbert called a meeting of all the rangers in the evening to ask their advice on how to proceed tomorrow. They also offered a bonus if an elephant is collared tomorrow. The rangers felt that we should return to the area where we had found fresh elephant signs two days ago. We left Wikki after breakfast and headed for the northwest sector of the park. 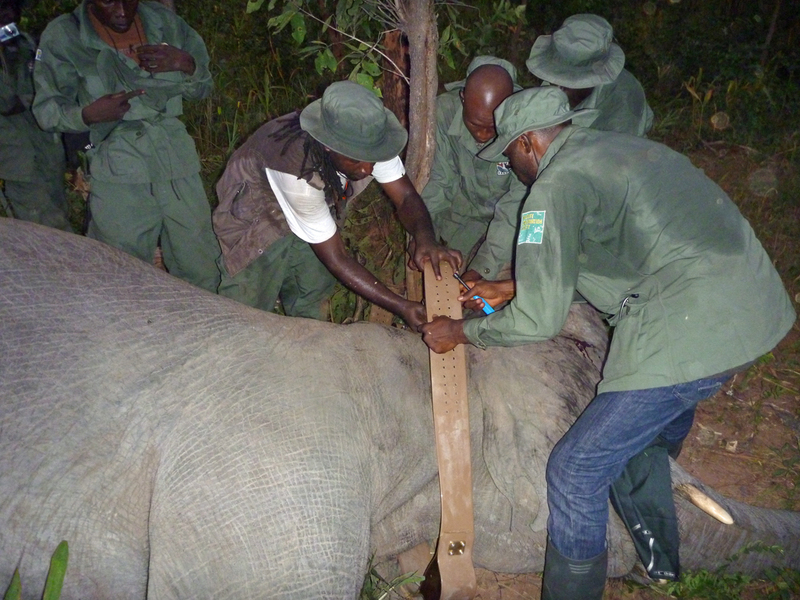 The rangers suggested that the darting team be stationed on a movement route that the elephants routinely use. This happened to be the exact place where we ended our trek on 21 October and waited for the vehicles. The rangers were dropped off on a park road southeast of our location. We were to stay in radio contact for news from the ranger team. In theory, if the elephants were disturbed, they would head in our direction. After several hours, we had not heard from the ranger team. A couple of rangers on our team hiked to a small hill near our location, from where they were able to make contact with the ranger team. 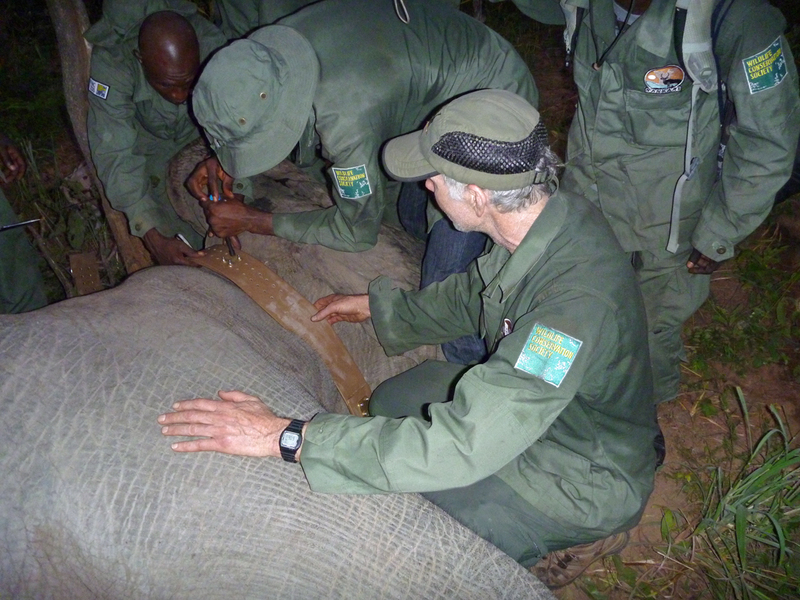 We learned that the ranger team had located fresh elephant tracks and had approached close to the elephants. They then backed off to a road to wait for us to meet them and then to approach the elephants for a darting attempt. We started following the elephant tracks. The elephants had moved from their previous location. We continued following the tracks. When we found very fresh dung, we sent three rangers ahead, and the rest of the team followed about 200 meters behind to keep the noise at a minimum. We approached until we could hear the elephants feeding. Jonah and I then approached the herd to attempt a darting. We could see the elephants, but we did not have a clear target. The elephants kept moving off slowly, with Jonah and me following. We could approach fairly close to the elephants, but still could not get a clear shot. Finally, at a little past 1700, I maneuvered into a location where I had a clear shot at an elephant. The elephant was a young adult. I had hoped to dart the herd’s matriarch, but never got a clear shot at her. By this time, it was 1720. I felt if we didn’t get a dart into an elephant soon, it would be too late to finish the collaring before dark. Therefore, I darted the young adult female. The herd immediately began to run. We called for the support team, but they did not hear us. We kept calling for about five minutes. I was concerned that we were not following the darted elephant. Jonah fired his rifle into the air to alert the support team. We still did not hear from them. Jonah fired two additional shots, and we finally heard a shot from the support team. 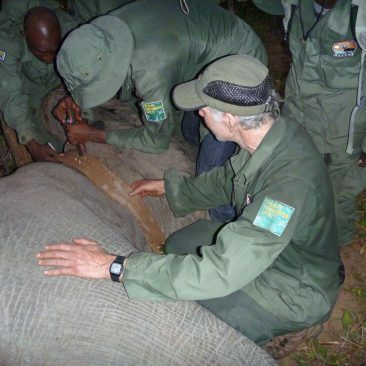 They eventually arrived at the darting site about 20 minutes after the elephant was darted. We started following the elephant trail and found the elephant down and breathing well about ten minutes later. It was starting to get dark. We quickly attached the collar and reversed the elephant. She stood up in three minutes and ran off in the direction of her herd. Everyone was extremely happy! 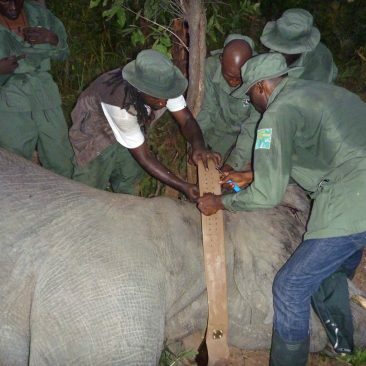 This is the first elephant ever to be collared in Nigeria. We then started walking back to a road in the dark. It took us about an hour to reach the road. We called our vehicles on the satellite phone, and they arrived at our location in about twenty minutes. We drove back to Wikki and had dinner. I had a nice hot shower after dinner and went to bed for a good night’s sleep.